When running becomes positively negative! The first time I heard the term ‘negative split’ I had no idea what it meant. When I looked it up and discovered it meant running your last km or mile faster than your first, I thought that sounded easy, right? Doesn’t every runner start off slowly and work up to a faster pace? Turns out, it’s a lot harder than it sounds, and up until a few weeks ago, I had never run a negative split. Imagine my surprise when I then I ran a negative split not once, but twice by complete accident! The second time I ran a negative split was an even bigger shock. It happened on a Friday morning after a night of insomnia. I’d had about an hour of sleep, was feeling tired and a bit grumpy, but I’d planned a 6k run and I was awake anyway so off I went. I wasn’t expecting it to be a great run, considering my sleepless night. 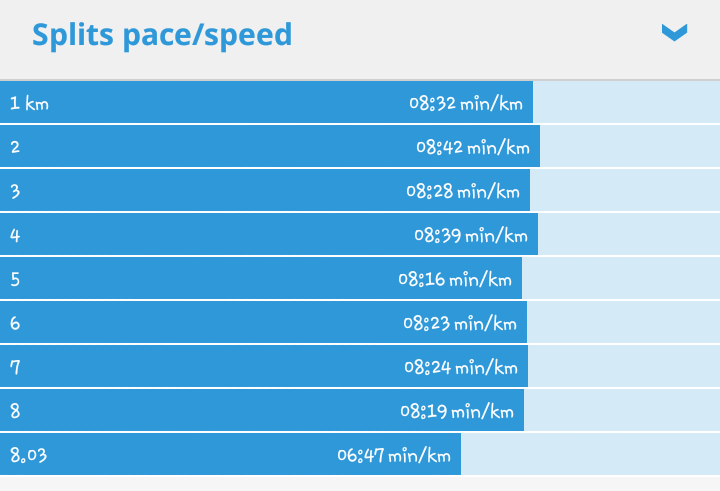 But not only did I overshoot the 6k by running nearly 6 and a half, but I again ran it faster at the end than the start. My first km was in 8:34, my last was 8:16. I think it’s funny that when I try to go faster at the end of my run, and sometimes I actually think I AM faster, it turns out I’m not. Then, when I’m not even trying or thinking about it, I run a negative split by accident.